N amibia has a dry climate for much of the year, which means the anticipation of rain is a big feature for the Namibian people, plants and animals. By November the clouds start building up and it becomes hot and oppressive, especially up north. By February the rains are in full swing and the countryside turns a beautiful shade of green! Rivers that are dry for most of the year, suddenly become raging torrents. The weather at the coast at this time is perfect for swimming and summer holidays. 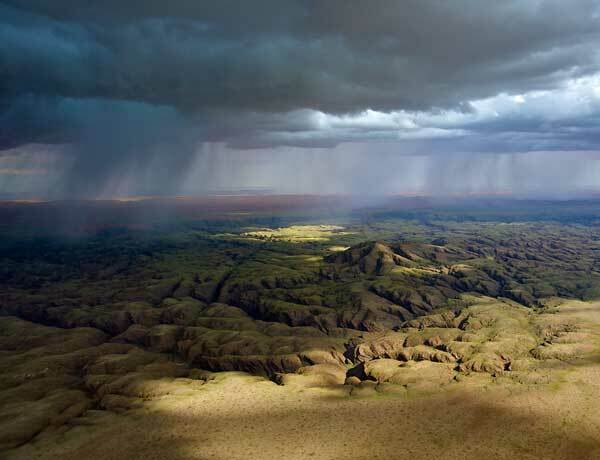 Our rainy season generally continues until early April, when the migratory birds leave Namibia for another year. The hot and humid weather conditions in summer make it an ideal breeding time for mosquitoes. MALARIA is still the major killer disease in Africa and you will need to take precautions when visiting during summer. Generally anywhere north of Windhoek can be a high-risk area, especially up in the wetter northern parts of Namibia. Take prophylactics before you leave home, should you become ill remember to mention where you’ve been to your doctor. Spray on mosquito repellent; wear long sleeves, leggings and socks at night and sleep under a net if possible. Symptoms of Malaria include headache, fever and violent shivering. 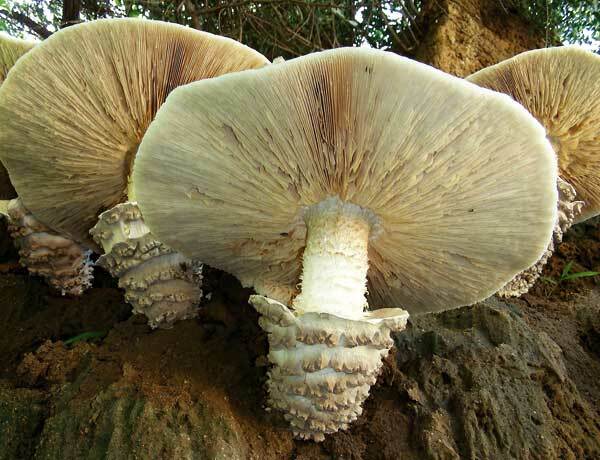 It typically starts one week to a month after you’ve been bitten. Riverbeds – Watch out for flash floods in riverbeds during summer. Never camp in a riverbed at this time of the year, and always wade through wet sand first to establish the depth before you drive across. Slippery roads – The tar roads are often slippery when the first rains fall, so exercise caution and don’t drive too fast. Lightning – Many people are killed by lightning in Africa each year. Move indoors if an electrical storm is approaching and don’t talk on the phone! Keep away from anything that conducts electricity. At the beginning of summer it is very hot in Namibia. With cloud build-up during the day, the nights can become quite oppressive if it doesn’t rain and the cloud cover remains. Wear cool clothes made from natural fibre such as cotton and linen. Due to the humidity, clothes may not dry overnight. Once the rains start in earnest, the temperatures slacken off quite a bit and you may even need to pack a lightweight jacket for evenings and game drives. Pack your swimsuit, as summer is a wonderful time to swim in the sea at Swakopmund. Take care to stay out of swimming pools inland when there is a storm brewing, as water conducts lightning. Summer is hot and often humid, so we tend to seek out the cool dryness off air-conditioners to make life more bearable. Try to use yours only when you’re in the room and switch it on sleep mode when you retire. Switching it off when you leave the room for a while and especially when you check out is the sensible and considerate thing to do. Keeping the curtains closed during the day also helps keep the cool air in and the heat out. Following the first rains, buttercup-yellow devil’s-thorn flowers (Tribulus zeyeri) spring up in vast carpets all over Namibia. 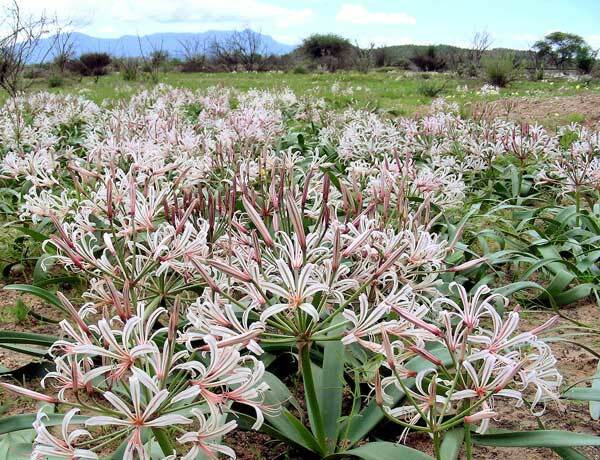 In summer this is one of the most prominent flowers you’ll see in the country, except in the northern Kalahari regions. Along the roadsides between Okahandja and Usakos, look out for swathes of yellow and pink cleomes waving prettily at you! 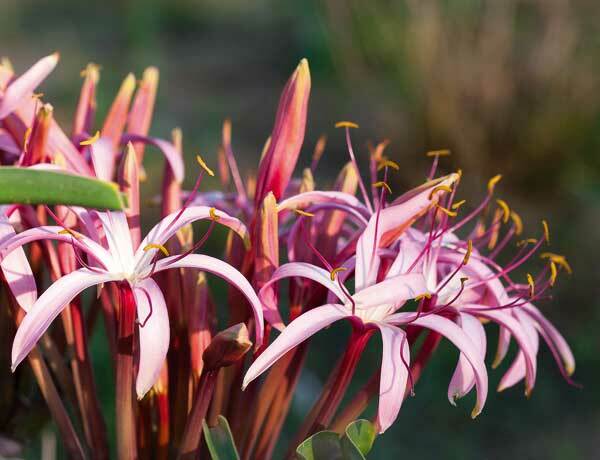 Members of the Crinum family – will also be relying on a good rainfall before showing you their pink secrets. See the Crinum buphanoides next to the Franke Tower in Omaruru, and travel to Farm Sandhof near Maltahöhe to view 800 hectares of Crinum paludosum! Be sure to call the Maltahöhe Hotel first to find out if there’s been enough rain, as this is an unpredictable event! 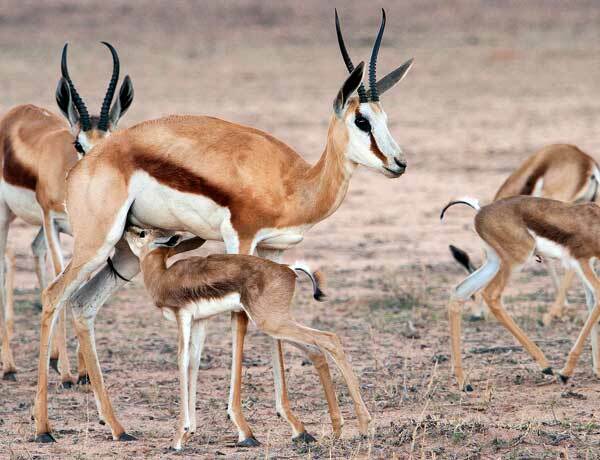 Springbok will also be calving when the rains start, having carried their young for six and a half to seven months. The fresh grass feeds the vegetarian antelope, which in turn feed the predators. Summer finds the big cats well fed and in good shape. Early summer is still a good time to spot the predators before the grass becomes too long for viewing. As the rains progress into February, game viewing becomes disappointing. The antelope have dispersed and no longer need to visit the waterholes daily, as there are sufficient pools of water in the veld. At this time of year there are many other non-breeding migrant birds that have come to feed at the coast. Look out for grey plovers, common and Sandwich terns, and common and curlew sandpipers, as well as other regulars such as black-winged stilts and the rare African oystercatcher. If the rains are good, the flamingos will migrate from the coast to Etosha Pan to breed. Inland you could see large flocks of Abdim’s storks circling overhead, as well as equally large flocks of yellow-billed kites catching termites on the wing. If you’re a cuckoo fan, then Namibia’s your place! The green Diderick cuckoo is one of the first to arrive by mid-September, followed by Jacobin and Levaillant’s. By November, my favourite, the black cuckoo, fills the woodlands with its mournful song. In Etosha look out for breeding red-billed queleas weighing the trees down with their combined weight, the clownish coloured wattled starlings, European rollers, European bee-eaters and the flamingos that have come to breed on the pan. Flocks of black-winged stilts fill the air with twittering sounds near Namutoni. On northern rivers such as the Okavango, Kwando and Zambezi, it’s time for colourful flocks of carmine bee-eaters, woodland kingfishers and African skimmers to be in evidence. 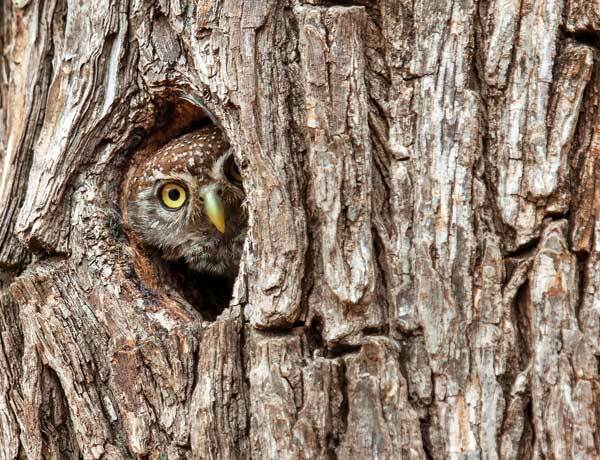 You’ll see nest holes in trees being utilised everywhere, and you may even be lucky enough to find a pearl-spotted owlet peeping out at you!